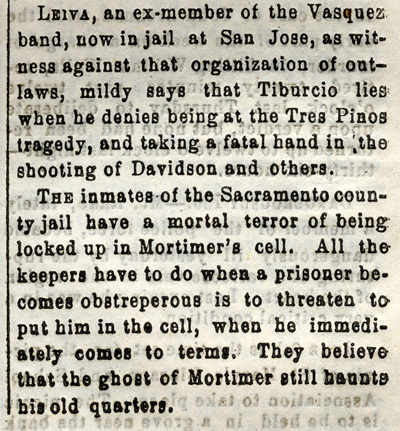 Stockton Weekly Independent: Vasquez Captured, 5-23-1874. 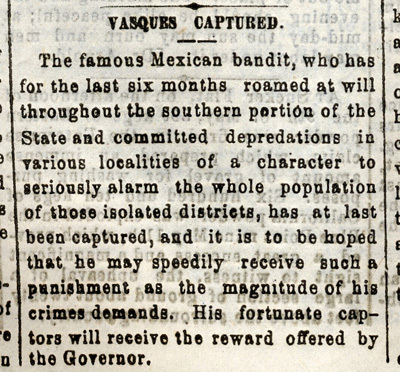 The famous Mexican bandit, who has for the last six months roamed at will throughout the southern portion of the State and committed depredations in various localities of a character to seriously alarm the whole population of those isolated districts, has at last been captured, and it is to be hoped that he may speedily receive such a punishment as the magnitude of his crimes demands. His fortunate cap­tors will receive the reward offered by the Governor. LEIVA, an ex-member of the Vasquez band, now in jail at San Jose, as wit­ness against that organization of out­laws, mildy says that Tiburcio lies when he denies being at the Tres Pinos tragedy, and taking a fatal hand in the shooting of Davidson and others. Vasques--His Companions Still at Large. LOS ANGELES, May 15.—The excitement which was created in our city yesterday afternoon on the capture of Vasques, has scarcely abated to-day. As many as were permitted visited him during the day and many were turned away without the coveted sight. From the physician in charge of the wounded prisoner we gained full details in rela­tion to his injuries. 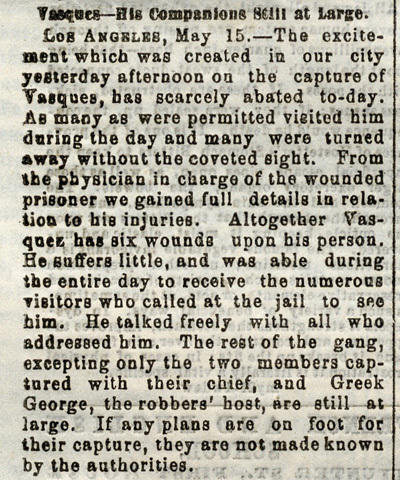 Altogether Vas­quez has six wounds upon his person. He suffers little, and was able during the entire day to receive the numerous visitors who called at the jail to see him. He talked freely with all who addressed him. The rest of the gang, excepting only the two members cap­tured with their chief, and Greek George, the robbers' host, are still at large. If any plans are on foot for their capture, they are not made known by the authorities.